Consider the dilemma of the socially conscious, conscientious objector whose skin color and/or religion does not align with mainstream White Christian Western society. When a real, perceived or anticipated injustice — usually one involving violence — inspires protesters to respond with violence, critics (even those who claim to understand the frustration and anger involved) ask derisively why said protesters cannot be peaceful and air their grievances without violence, property damage or halting traffic. When protesters air their grievances peacefully and/or silently, critics complain about that, too. If you didn’t know any better, as a member of an oppressed class, you might start to think that the privileged classes would like it if you just stayed quiet and accepted whatever injustices or indignities may fall upon you and yours. 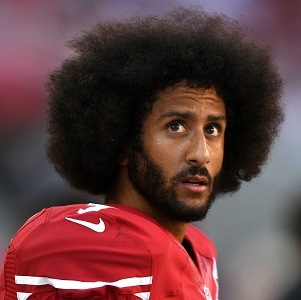 Last NFL season, one of the dominant story lines centered around Colin Kaepernick, the San Francisco 49ers quarterback who quickly became the most polarizing athlete in the United States this side of LeBron James when he began a weekly routine of sitting down or kneeling during the traditional pre-game playing of the national anthem. Kaepernick said he was protesting his country’s treatment of minorities, including police brutality and government neglect. Death threats were aimed at Kaepernick. Boos and chants of “U-S-A!” rained down on him whenever he took the field. Media pundits and fans fried him in their own courts of public opinion. And at the same time, Kaepernick received lots of support from the rich and famous as well as the poor and disenfranchised. He was cheered by some fans, while others wore his jersey to games and sat or knelt in solidarity with him during the anthem. Many media members and fans applauded him for taking a stand. The funny part was that a lot of the people who hated Kaepernick and what he was doing couldn’t (or didn’t want to) see that he was only exercising the same freedom of speech and right to criticize institutions that they believe makes America great. But because Kaepernick was bringing to light something uncomfortable to confront, he was accused of being un-American and a traitor. Now we are on the eve of another NFL season, and Kaepernick, currently a free agent, has not been signed by a team. A talented dual-threat quarterback who is only 29 years old and led his team to the Super Bowl just four years ago is apparently not good enough anymore to get a job in a league in which lesser-qualified quarterbacks are making eight-figure salaries. It doesn’t take a well-researched social scientist to see what that’s about. Meanwhile, on the other side of the world, the most popular two-sport star in New Zealand has been dealing with similarly negative reaction to a similarly peaceful form of protest. Sonny Bill Williams, a professional rugby star and heavyweight boxer, recently ignited a controversy when he covered up the Bank of New Zealand sponsorship logo on his rugby team’s jersey. Williams cited his religious beliefs as a Muslim as the reason behind his action, as it is forbidden in Islam to charge interest on money given as a loan. In response to his protest, Williams’ team agreed to provide him a customized jersey that does not contain the bank’s logo. End of story, correct? You might think that the only people upset about Williams’ protest would be the Bank of New Zealand. (A bank spokesman actually said they didn’t take issue with it.) But there is a legion of fans and media hot-takers whose outrage over Williams’ protest and the “special treatment” he’s received as a result is at 2016 Kaepernick levels. Despite the chiming in of a powerful political figure, Williams most likely won’t experience anywhere near the same professional repercussions for his peaceful protest as Kaepernick is feeling for his. That is due to a couple of factors. First, Williams is a bigger and more powerful figure in his sport than Kaepernick is in his. Quarterbacks are replaceable in the NFL, and while Kaepernick is better than many of his critics will admit, he’s also not on par with the likes of superstar signal-callers Tom Brady, Aaron Rodgers or Cam Newton. Williams, meanwhile, is arguably the best rugby player in his country and a valuable member of not just his pro team, but also of the New Zealand national team. Whatever rugby coaches or roster-building executives may hate Williams’ religious stance will still want his talent on their team. Second, Williams did not put his country on blast like Kaepernick. Money might make the world go ’round, but it’s not defended with as much passion as some people defend their ideals of patriotism and national pride. Williams protested a business and its financial practices. Kaepernick protested a country and its precious image of itself. Both men took a stance against something they felt is wrong, and did so in an admirably peaceful yet effective fashion. Both men have been willing to face the consequences that come with that, and have not backed down. Their detractors and critics who claim to be patriots should in fact be proud to call them countrymen. well the REALLY effective way to UNALIGN with WESTERN CIVILIZATION is to see by faith if not by sight that there is no injustice! “you will not find a flaw in what ALLAH created” says the Quran because how can God make a mistake? and karma IS the hand of God ON EVERY HAND and who can move the hand of God but God and the LIFE IN YOU IS GOD AMEN?! if you have reaped you must have sown – how can you reap if you had not sown? but what cain did to abel enabled abel to get back to the True Life amen? Muhammad said “Slay and be slain in the cause of God”. the message brought by Jesus dovetails with the message brought by Muhammad does it not?